We were tasked with transforming the Mecure Newton Park Hotel in Burton upon Trent for this wedding reception. The client approached us directly and asked us to provide a number of lighting solutions to add an additional WOW factor to this hotel wedding venue. Outside the venue we installed 6 of our super bright LED flood lights. These were set to wash both the walls of the venue as well as the walkway in a colour pre selected by the bride. Inside the venue we installed 16 of our LED compact par cans to wash the walls with alternate colours. A pink / purple and blue colour was chosen for this element by the client which we felt worked really well. To add an additional element to the venue we installed a couple of profile lights which contained our snowflake gobos. This provided a number of snowflake images onto the wall of the venue which fitted in with the theme for the wedding. 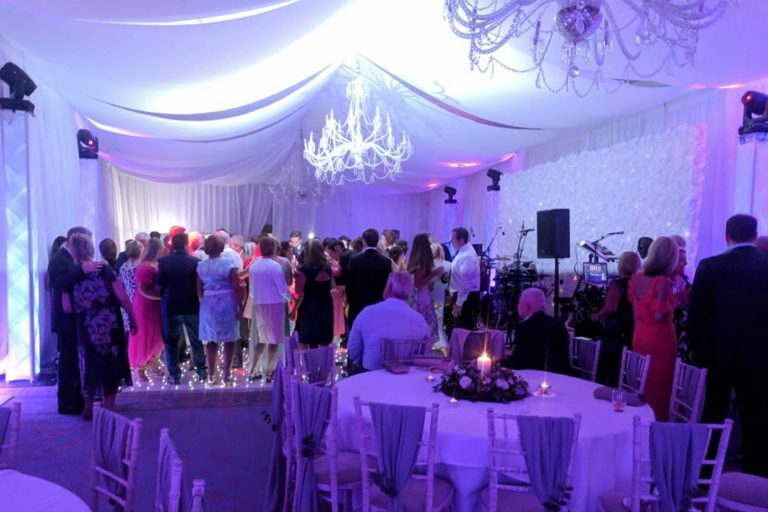 During the room turnaround our event crew returned to the venue, and the evening reception installed a 12ft x 12ft black starlit dance floor for guests to dance the night away on. At Premier we exclusively use starlit floor manufactured by Portable Floormakers due to its reputation for being the most reliable starlit dancefloor in the UK. It uses a wired system, which physically connects each panel together using a cable to ensure that all of the panels remain working throughout the wedding reception. The evening entertainment came in the form of one of our Wedding DJs (Nigel) who kept the dancefloor busy from the first dance onwards. The client provided our DJ with a list of requests in advance as well as course as the first dance. Requests were made throughout the evening by the guests which were incorporated into the evening playlist. To find out more about how Premier can transform your wedding venue please don’t hesitate to pick up the phone and give us a call on 0116 2029953, or simply send us an email. We look forward to hearing from you.